The weather was perfect for flag football and the Maize and Blue Bowl on the University of Michigan-Dearborn campus last Wednesday afternoon. The alumni, led by star quarterback, receiver, defensive back, and fan favorite Anwar Beydoun, were ready to put an end to the student’s flag football winning streak. They did just that, downing the students with a thrilling 48-24 victory. “The experience alone was bittersweet playing against all of my old teammates, but at the end of the day, all I care about is winning,” Beydoun said. But before the game even started, many players complained of the conditions on the field. “Can we change the location of the game to a field where there isn’t a sewer in the middle of it?” said Ryan Petras, a big time defender for the students. The location was changed and the alumni took full advantage of their new digs. Beydoun wasted no time getting the alumni off to a fast start with an opening drive touchdown pass to Tom Wille to give the alumni a 6-0 lead. Following an interception thrown by the students, Beydoun and company were looking to strike once again. 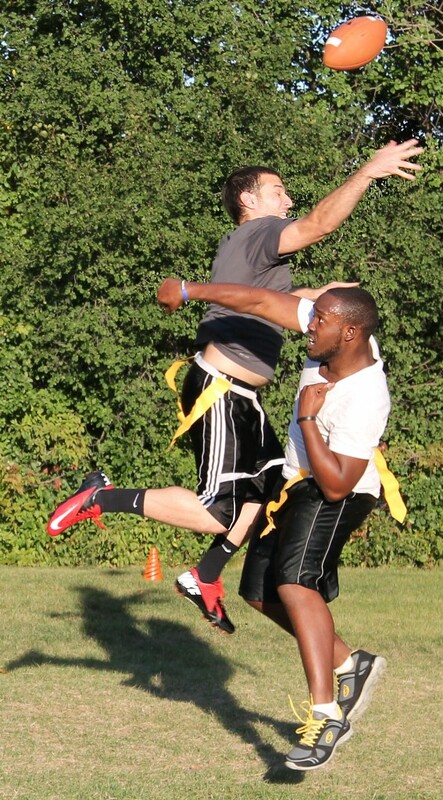 On a fourth down attempt, with the ball approximately 10 yards from the end zone, Beydoun was looking for a receiver that appeared to be wide open, but then defensive back and self-proclaimed “LeBron James of flag football” Michael Parker, came away with a big stop to keep it a one possession game. The students would appear to respond after Parker’s big defensive play, with a TD reception by Gerard Roberson that was ruled out of bounds. On the student’s next possession following another stop, Roberson hooked up with Jewell Jones on a deep pass and gave the students their first score, tying the game at six. Not only did the alumni have Beydoun, but they also had a pretty good second-string quarterback in Mike Asaad as well. Asaad did his best Robert Griffin III impersonation and scrambled for a touchdown out of the pocket, giving the alumni a 12-6 lead. The students would respond with a rushing touchdown of their own by Bradley Pischea to tie the game at 12 on their next possession. Asaad would then show his best Peyton Manning impersonation, throwing a long frozen rope touchdown pass to Beydoun to give the alumni a 18-12 lead. Jones followed that up by catching his second touchdown pass of the game to tie the game at 18 at halftime. The second half was owned by the alumni team. In the opening minutes of the half, Parker provided some hope for the students and grabbed an interception in one-on-one coverage and took the ball all the way back to what would be the alumni’s 10-yard line. Following the interception by Parker, Jones caught a ball in the back of the end zone, but it was ruled an incompletion after a controversial call by the referee, one that would’ve given the students the lead. Following the controversial call, the students began to lose their poise, and Beydoun took full advantage of this, giving the alumni a three score lead following a tip toe run in the corner of the end zone. The students knew that they had to strike back fast, and linebacker Roger Castillo was having none of that. 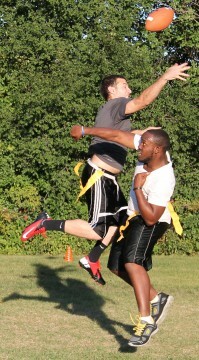 Castillo had two big interceptions late in the game to put the exclamation point on the victory for the alumni. Following one of Castillo’s interceptions, Student Government president Wedad Ibrahim made a big play of her own, representing not only the students, but the ladies on the field. Unfortunately for the students, Ibrahim’s efforts would not go unnoticed, but they would not be enough for the students to emerge as winners in the Alumni Challenge for the second year in a row. Castillo was sent home with the game ball for his performance that evening. Beydoun was awarded as the alumni’s offensive MVP after finishing the game with four combined touchdowns (two receiving and two rushing). The offensive MVP for the students was Jewell Jones, who finished the game with three touchdown receptions.